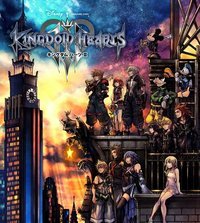 At the Kingdom Hearts Union X[Cross] event in Anaheim, Square Enix released a short new trailer for Kingdom Hearts III. The footage showcases some of the minigames you will find, which are in a 1980's LCD game style. There are said to be more than 20 such minigames in total, which become available as the player progresses through the game. The trailer also gives a quick look and returning residents from Twilight Town - Hayner, Pence, and Olette. Kingdom Hearts III is set to release on PlayStation 4 and Xbox One later this year.